The city authorities modestly call it "the best metro train in the world" and affirm that it’s one and a half times cheaper than its foreign equivalents. New generation train with several advanced features is up and running. 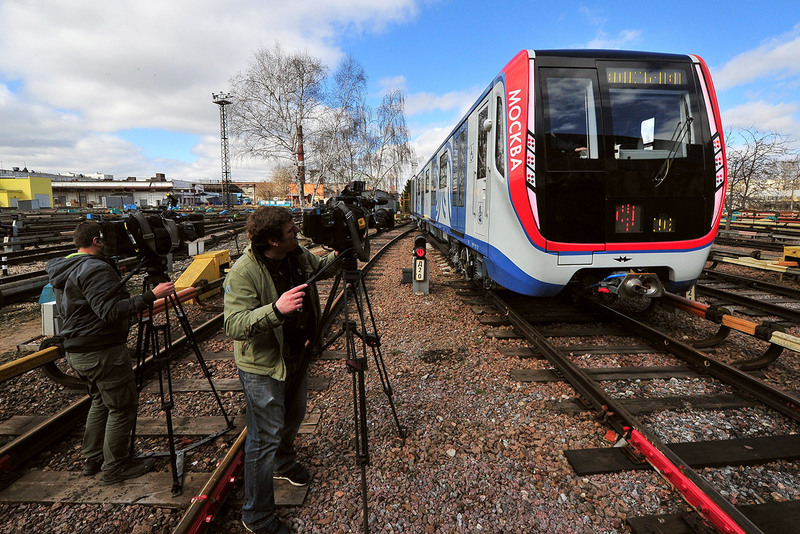 The capital's metro has launched a new generation train called 'Moscow.' It’s "revolutionary," silent, spacious, and has new interior LED lighting. The city authorities modestly call it "the best metro train in the world" and affirm that it’s one and a half times cheaper than its foreign equivalents. The new trains are running only on the busiest line, the Tagansko-Krasnopresnensky (violet), and are undoubtedly impressive. Unlike other trains on the Moscow metro, passengers say that this train runs "unrealistically smoothly and very silently" – apparently it’s like being in an electric car. Silent and smooth motion has replaced the abrupt and sometime brain-rattling movement of the current metro carriages. In the old trains, passengers are recommended to hold on to the handrails given the breaks are sometimes slammed on, grinding the train to a shaky halt. It can be like trying to surf on the crest of a wave, balance is everything. But it seems that in the new carriages this skill is not needed. You can confidently stand the whole journey without leaning on a wall or a rail, or even walk through the train: It has pass-through wagons. For people who love to stand on the metro, it’s become a little more comfortable. Travellers can now perch their behinds on a number of "half seat" dotted around the carriages. The second is USB ports for charging electronic gadgets. They can only be used by those who are standing though, since they are located where there are no seats. And just like the old ones, this train has free Wi-Fi. Repair schedules, information for "what to do if…," tariffs, regulations, advertising – everything that is glued on the interiors of the old trains can now be seen on interactive touch screen monitors. The monitors can help you create your itinerary, calculate the time of the journey, and even beams TV channel if you want. Obviously, it may still be possible to find some advertising and other information on the walls. Developers of the train have also thought of the lighting. As a result there’s "cold" light in the morning and "warm" light in the evening – or "mood" lighting if you will. Vertical LED panels frame the doors. If the door is closed, the light is white; if it’s open – red. Lines begin flashing to signify the door is closing. On the external side of the door the format is the same. Inside the train a green light will highlight each approaching station (the metro scheme is also backlit). Basically, every part of the wagon is illuminated. Even the sockets and USB ports have LEDs. Muscovites are used to standing next to the door, even if they do not plan on getting out at the next station. This bothers passengers entering and exiting the train, but it seems nothing can be done about this habit. However, the doors of the new train are wider. Visually, it cannot really be noticed. You will not be surprised by their breadth, but the area has become more spacious. Some seats in the train fold back against the wall and there is room for bicycles, carriages and wheelchairs. The train also has handrails, a "corky" floor, and an air disinfection system.